Sony Boss: Don't "Shove Something Down a Consumer's Throat"
CEO Jack Tretton says the PS4's roll out and E3 presentation are the result of experience and discussions with consumers. Even weeks later Sony's 2013 E3 conference is still arguably the talk of the town. In one fell swoop Sony set up the PlayStation 4 as the champion console of gamers and backed Microsoft's Xbox One into a corner that eventually forced the company to reverse new and unpopular policies. While many believe that the moves that won the day for Sony were last minute additions to the company's conference strategy however, the company insists that its E3 presentation was long in the making. "We've really been planning [the Playstation 4 launch] since 2008," said Jack Tretton, CEO of Sony Computer Entertainment America. "The E3 press conference in the spring and the rollout was a culmination of that vision. The reaction is a testament that we got the strategy right. It's a long, ongoing process." One of the keystones of Sony's E3 victory, its $399 price point, was the result of both years of experience and months of planning. 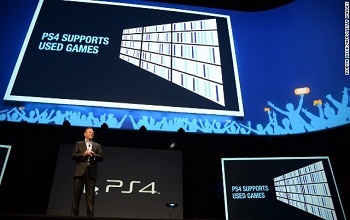 The company learned "a lot of lessons" from the hardships it experienced launching the PS3. "We came to the market at $599," said Tretton. "That's obviously not going to happen this time around." While the PS4's sticker price was a big draw to many, its gamer-friendly policies were arguably more important. According to Tretton, these were also a result of the company's lengthy preparation. "We spent a lot of time talking to consumers," said Tretton. The company's discussions apparently led them to believe that what players value most in their hardware is "choice." "Never try to shove something down a consumer's throat that they don't have an appetite for," said Tretton. It was a message that resonated with E3 audiences, and one that seems to be doing well by the PS4 itself as the calendar ticks us closer to its eventual launch.